Montessori education, founded by Dr. Maria Montessori (see biography below), is based on the theory that children before the age of six are similar in nature to sponges. They are able to absorb, with little effort, concepts and ideas from their environment. It is therefore of paramount importance to have an environment that is carefully prepared to aid the child in learning to their full capacity without them realizing the magnitude of what they are learning. The Montessori classroom is a carefully prepared environment where children learn using materials selected by the directress to help the child absorb the concepts of language, arithmetic, history, geography and science. Children between the ages of 3 and 6 enter into periods of time in which they are more easily able to learn certain subjects. These are referred to as “sensitive periods” and include a sensitivity to arithmetic, language and order. As a child is observed entering into one of the sensitive periods, they are encouraged to work with materials from that area in the classroom. As children are working with materials that appeal to their sensitive period, the learning is effortless and forms a part of the foundation for future learning. 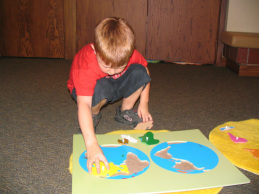 Montessori felt that children needed to have independence and control over their own learning environment whenever possible. This focus on independence is achieved by a strong commitment to teaching children how to care for themselves and to care for the environment in which they learn. The classroom for this age group is known as “the children’s house” and is structured to belong to the children. Children learn to clean and maintain their environment along with taking care of their own needs. Once mastered, these abilities lead to a greater sense of self confidence in children that forms the foundation for future learning. Maria Montessori, the founder of the Montessori teaching philosophy, was born in Ancona, Italy in 1870. She was adored by both parents who encouraged her to seek out new challenges whenever possible. In 1875 the family moved to Rome and Maria was exposed to a far more cosmopolitan life. At age 13 she entered into a technical school and began to study engineering. During her studies she came to the conclusion that she would prefer to study medicine, she applied and was accepted to medical school. She obtained a score of 100/105 on her final exams and was granted her medical degree in 1896. She was the first woman to be awarded such a designation in Italy. During her first year after graduating, Montessori began to research and develop a way to educate children who were considered to be unteachable. In 1901 she was able to put her theories into practice when she was given a small school in Rome to teach “challenged children”. Through the use of her teaching method, Montessori proved that all children have the ability to be taught and all benefit from the freedom to choose an environment that brings them closer to the natural order. Children, for the first time, were treated with respect and dignity and Montessori was able to show repeatedly that given the correct environment and guidance from the teacher, children could learn seemingly impossible tasks with little effort. Montessori traveled extensively throughout Europe and the Middle East between 1910 and 1930, establishing schools and training teachers to follow the method that she had proven successful. In Montessori’s later life she continued to expand on her theories of education and wrote many books outlining the importance of the early education of children in a way that allowed them to become a part of the natural order of the world.